Have your credit cards ready: you’re about to enter the world’s largest shopping mall. Known for its space-age skyline, gold-plated sports cars, and lavish lifestyle, Dubai in the United Arab Emirates is all about living large — and nowhere is that more apparent than The Dubai Mall. The world’s largest shopping mall by total area, the Dubai Mall in Downtown Dubai spans 13 million square feet (enough to fill five Empire State Buildings), with more than 1200 stores, 200 eateries, and scores of leisure and entertainment options. Since opening in November 2008, the Dubai Mall has become one of the most-visited destinations on the planet. Today, it attracts over 80 million shoppers each year — more than the total number of people who visited New York in 2018. To help you navigate this super-sized center, we’ve created the ultimate guide to the Dubai Mall’s shopping, dining and leisure attractions. For clothing and jewelry from the globe’s most coveted labels, hightail it to the freshly minted Fashion Avenue. Lined with gleaming white marble, glass and chandeliers, this ultra-glam expansion promises a five-star experience, complete with personal shoppers, chauffeur-driven buggies, and washrooms fit for royalty. It houses 80 high-end boutiques from the likes of Cartier, Dior, and Gucci, plus flagship stores for Rolex and Saint Laurent. To browse homewares, fashion and accessories in one handy location, zero in on Dubai Mall’s upscale department stores: the three-story Bloomingdale’s outpost or French export Galeries Lafayette on level two. For a Cinderella moment, visit Level Shoes on the ground floor of the mall. This 96,000-square-foot store is a temple to designer footwear, featuring the latest pairs from Dolce & Gabbana, Jimmy Choo, Sarah Jessica Parker, Manolo Blahnik and more. After something a little easier on the wallet? Shop for high-street labels from Europe, the UK, and the US, such as COS, Mango, Ralph Lauren, and Zara, on the ground floor and level one, or head to The Village precinct for denim, sports and leisure wear. If you’re on the hunt for the latest high-tech gadget, swing past the electronics hub on the second floor. Score souvenirs, gold jewelry, perfumes and carpets in the Souk, a marketplace of 200-odd tiny stores on the ground floor. While you’re there, spy the Dubai Dino, a 155-million-year-old diplodocus skeleton in the Souk’s atrium. Next, follow the scent of sugar and butter to La Cure Gourmande on the lower ground floor, a vintage-style sweet shop selling cookies, macarons, caramels, and chocolate-coated dates. By now, you’ll have walked some serious miles and worked up a sizeable appetite. Head for the lower ground floor near the Dubai Fountain, where you can recharge with cake and coffee at Hummingbird or Magnolia Bakery; treat yourself to a three-tiered afternoon tea platter at Café Bateel; or enjoy vibrant Levantine salads and grills at Wafi Gourmet (nab a prime table on the promenade, overlooking the fountain). On the ground floor, get your French fix at the ultra-luxe café Angelina or Parisian-style bistro Aubaine; or indulge your sense of nostalgia with a choice of 120 breakfast cereals at Cereal Killer Café, close to the indoor waterfall. Sweet tooths, pay a visit to one of the world’s largest candy store, Candylicious, where you’ll find a dizzying array of chocolates, gummies, and candies from across the globe. It’s not all fashion and food, however. The Dubai Mall brings its bigger-is-better ethos to its entertainment and leisure options, too. Visit the Dubai Aquarium & Underwater Zoo to ogle thousands of aquatic creatures in the 2.6 million-gallon tank, including sharks, fish, and rays. You can even sign up to feed an otter or a baby crocodile. Take a spin around the Olympic-sized ice skating rink; test your skills in the Emirates A380 flight simulator, or make like John Wick during a virtual reality session at VR Park. Children can blow off steam at KidZania, while the whole family can take in a film at the 22-screen Reel Cinemas. Feeling spent after all that spending? Seek out the new Sleep Pod Lounge, near the Grand Parking entrance on level two, where you can book a private pod for an hour-long power nap. 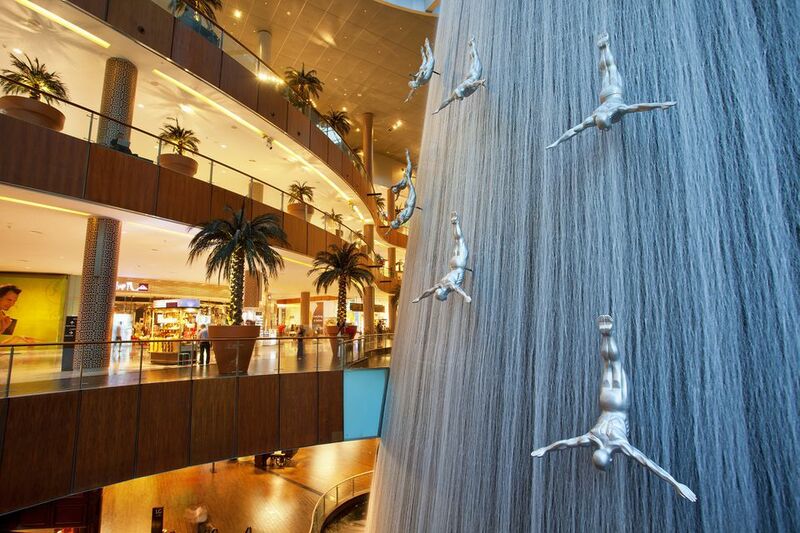 Located in the center of Downtown, the Dubai Mall is surrounded by some of the city’s most impressive sights. Next door sits Burj Khalifa, the tallest building on Earth at a cloud-piercing 160 stories. Take in views of Dubai’s sand dunes, skyscrapers and Arabian sea from the lofty observation deck, At The Top Sky Lounge on the 148th floor, or enjoy a meal with a view at At.Mosphere on the 122nd floor. Between the mall and Burj Khalifa lies the Dubai Fountain, another record-buster as the world’s largest choreographed fountain show. The five-minute music, light and water spectacle runs every half-hour from 6 p.m., and twice over lunchtime. For a front-row seat for the nightly performance, book a seat on a traditional abra boat or a spot on the Boardwalk, a floating platform that takes you within 30 feet of the fountains. Finish your day with dinner at Souk Al Bahar, an Arabic-style marketplace of restaurants and shops overlooking Burj Khalifa Lake. Or, enjoy cocktails on the terrace of the Address Boulevard, a luxury hotel adjoining the mall with jaw-dropping views of the Burj Khalifa. The easiest way to get to the Dubai Mall is via the state-of-the-art Dubai Metro. Alight at the Burj Khalifa/Dubai Mall Station, then follow the Metro Link Bridge to the mall’s entrance. There’s also valet parking available if you’d rather drive, as well as taxis, Uber and Careem services. The Careem app is indispensable if you’re traveling with a tot: Careem Kids cars come fitted with a child seat. Bag a bargain: Time your visit to coincide with the Dubai Shopping Festival, a month-long sale that runs through January. Dress the part: The Dubai Mall is the place to flash your cash, not your flesh. Follow the Mall’s dress code by keeping your shoulders and knees covered at all times — gents, that goes for you too. Respect during Ramadan: During the Holy Month of Ramadan, there’s no eating or drinking in public during daylight hours, so most of the mall’s eateries don’t swing into gear until sunset. If you do need to grab a bite during the day, head to the curtained-off food court on level two. Get appy: Even the most committed fashionista needs help navigating this shopping metropolis. Download the Dubai Mall mobile app, then follow the prompts to your favorite stores.